Gifts from the Pirates: "A box without hinges, key, or lid, yet golden treasure inside is hid." Surprise Surprise another post based around potty training, I'm sorry if the updates are boring but when we decided to take on intense training to get him in to a great routine, choosing to not leave the house to much over the last couple of weeks has ended up taking up all of my time. Good news is that its going really REALLY well so far but.... its costing us a small fortune. To keep Opeie motivated and to lesson the accidents (which there has only been a couple of), we sorted out a box of new toys, Lego kits and fun things for every time he successfully takes care of business. As you can imagine when that means 4 or 5 successful potty visits at least a day, the box needs restocking quite regularly. Mrs M came home from work yesterday armed with a stack of mini boxes and a genius idea, so once Opeie was asleep we got started on the plan. 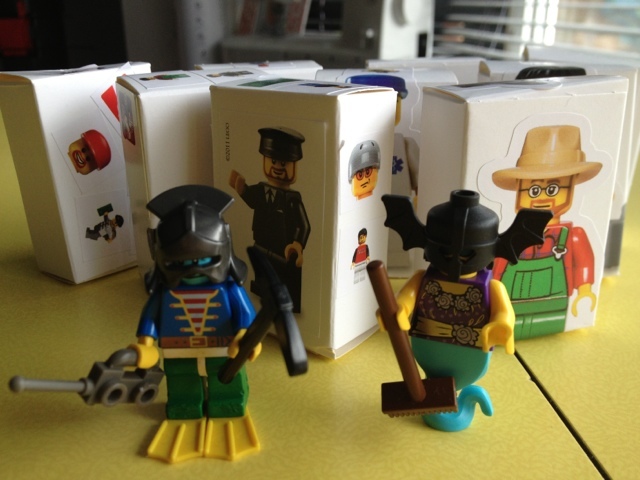 Opeie loves Lego mini figures and we have hundreds of them that we have collected over the years so last night we spent our evening making random characters ( one to fill each box ) with accessories and then decorated the boxes. This morning Opeie woke up and went straight on the potty which he has done every day since we started his training (clever boy). After relieving himself he said 'box' and seemed excited about the new Lego boxes that had taken over his reward box. We had decorated the boxes with stickers from a Lego sticker book that nanny and grandad had brought the boys last week. Opeie has had another successful day today with no accidents and the new Lego boxes have been a hit. The great thing about them is that while hes building the figure i can go and fill the box up again for next time. Mrs M you are a legend.